I love baking. I make decadent dessert recipes and I make healthy ones. The cookies I have been enjoying is definitely on the healthier side. Eating cookies is not the healthiest food you can eat, but if you can make them healthier and still taste good, this is how I imagine they would taste. 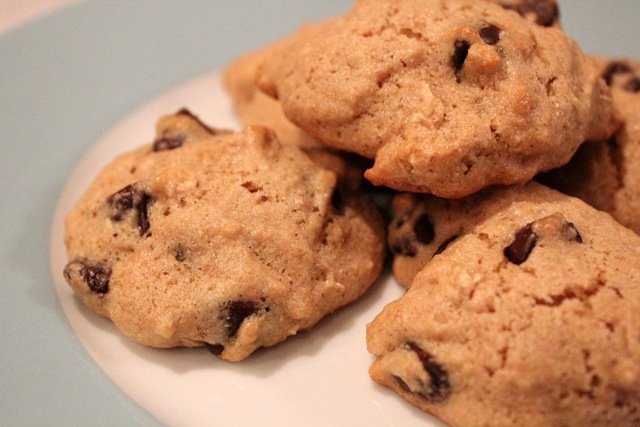 These cookies are moist but without any butter, the texture are more cake-like. The recipe is adapted from Tina’s recipe. They are light. They are fluffy. They are not too sweet. Mix dry ingredients with wet ingredients. Mix well until batter is blended evenly. Use a tablespoon to portion cookies and roll batter into a ball before placing it on a greased baking sheet, approximately 1-2 inches apart. Bake cookies for 10-12 minutes. Remove cookies from baking sheet and allow to cool on wire rack. I made half a batch without any coconut and just with chocolate chip cookies. They are both good. The batch with coconut just has extra texture and crunch. Lets talk dresses shall we? I love wearing dresses and I like to play dress up. I wear business style clothes for work so every chance I get, for example on the weekend or at social events, I like to wear something more feminine and more fun. I got a few emails regarding the dresses I wear and where I shop? Well, I like to shop for bargains. Because I know there are always sales and promotions going on, I hate to pay full price for clothes. I hardly ever buy something at full price. After you buy most of your wardrobe on discount, it’s hard to go back to paying full retail. One of my favorite brand for dresses is Arden B. All the dresses below are from Arden B., and I bought them all at a discount. They were either on sale, found at clearance racks, or at sample sale. I hope this helps a little for those who would like to start shopping for spring dresses. Bargain, bargain, bargain! Internet is your friend when it comes to bargain shopping. April, you are too sweet with your comment. I’m five foot nothing…j/k, I’m 5’3 but I like to wear heels a lot so that helps. I ❤ baking too and cookies are probably my favorite baked good to make! I think I could bake all day long. You do have some ADORABLE dresses. Arden B is a great store. I'm the same way- I never pay full price anymore, not worth it! I love the floral dresses…adorable! 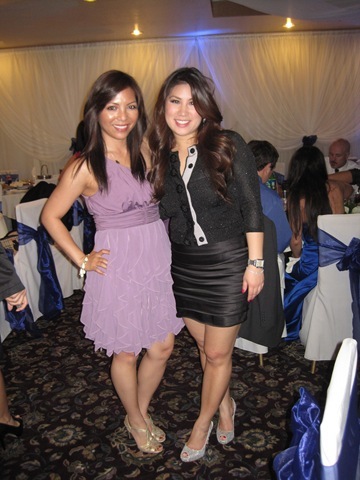 Arden B and BCBG are my two dress brands. 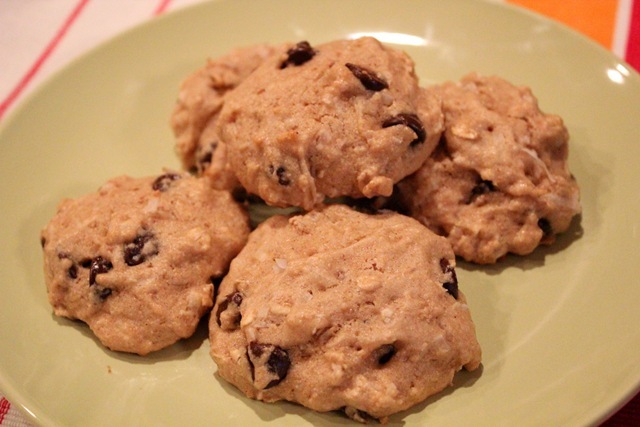 Those cookies are amazing-would it be considered healthy if I ate the entire batch? I don’t think it’s healthy to eat the whole batch in one sitting but if you must, lol! BUT it’s definitely healthier than _________ (fill in the blanks) something you buy from the store. Thank you, that’s one of my favorites too, the stretchy fabric is so comfortable. Sit, walk, stand and dance all night , it will survive! 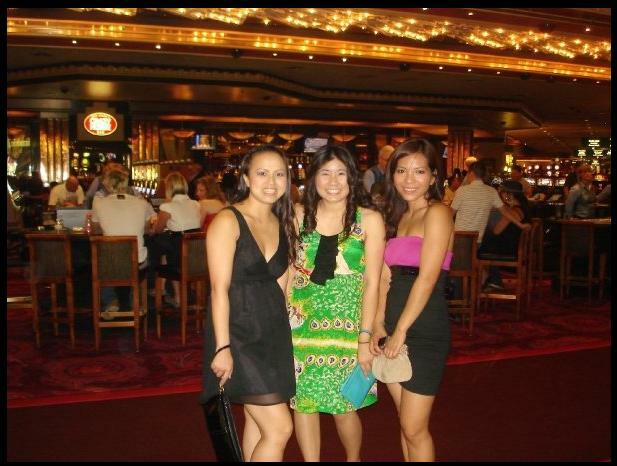 I wore it on a red carpet event in Las Vegas and I didn’t feel so out of place, lol! I love desserts. Thanks for sharing the recipe. I will surely try this out. Take the Dessert Personality Test and find out your personality on the basis of your favorite dessert. I have taken the test and have enjoyed a lot. Hope you too will enjoy it. Have Fun!! Yum! Those cookies look amazing! Those dresses are so pretty!! I definitely am going to have to check out Arden B for their sales! I think they sales where it’s like you buy 1 dress and get another one for 1 cent. Keep a look out for that one. You look so pretty! I love all of your dresses, Lea. Super cute dresses. 🙂 And I definitely will be trying that cookie recipe–they look delicious!! I have a super fabulous dress from Arden B. Must find an occassion to wear it out again! hello, miss shoe queen 🙂 I want to see your dress. Let me see! Let me see! Maybe we can get really dressed up for that imaginary trip we are going to make in Sonoma for my birthday 🙂 We should do a virtual dress party! i just made chocolate chip cookies on Sunday too, i made the unhealthy version though. 😉 yours look delicious! love all your dresses, i can’t wait for spring so i can wear all my dresses again. Those cookies look so good. Yummy. There’s so many inexpensive magazines that I get with cute clothes that are pretty much decent. Cute Dresses and who wants to pay full price on anything. I totally agree with you. Thanks Ameena with your sweet comment 🙂 Arden B dresses fit my frame, I’m 5’3 so their styles are flattering but they have some long dresses where I had to get it hemmed a few inches off. I can see if you’re tall like your height, that the dresses might fit too short? But then, you have so many more options when it comes with dress shopping. I wish I can be your personal shopper, I’ll throw in babysitting for Maya too. I’m that way with BCBG MaxAzria! 🙂 I load up on dresses every time I get a chance to swing by the outlet. Suki, i love BCBG MaxAria dresses too, maybe I’ll post dresses from that brand in the future. You have an outlet near you? So lucky! I buy mine at Nordstrom or Nordstrom Rack, but there’s an outlet about 60 miles south from near San Diego. And you have some super cute dresses! CUTE – I truly haven’t been in Arden B in too long – I used to go there and Bebe and then both got a little weird for me. HOWEVER – I would borrow/steal/buy all of these dresses so I must return to Arden B – thanks! So cute- I love all the dresses, especially the first one. I like Arden B too- they have a lot of fun pieces and are fairly reasonably priced. those dresses are fabulous!!! Love them! Gosh you’re so gorgeous, do alot of guys check u out? Oh and, where/when are the samples sales? I’m in Cerritos. Thanks! You really do have the cutest dresses! 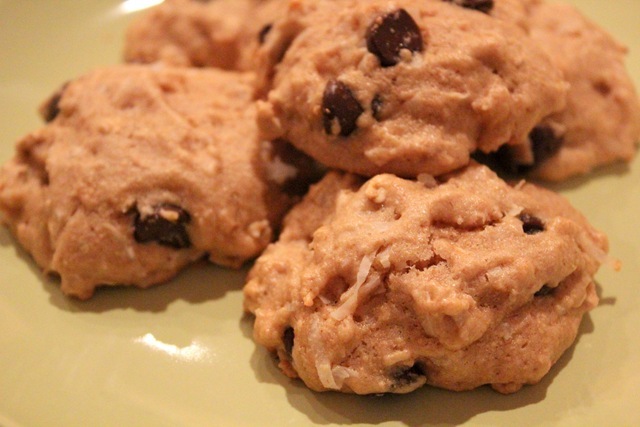 i made chocolate chip cookies today too…but a must less healthy version than yours. i am SO excited to be able to wear dresses again. Love the dresses! And, healthy cookies are always great..in moderation! I am making these cookies tonight. I hope you don’t mind if I post a link to your site for the recipe. These are right up my alley! If you use a little less egg, it won’t be as cake-ey if you don’t like that texture. You should also check out Maggie Sottero’s dresses. They are waaaay affordable, and have an expensive look & feel. Mindy, I was thinking that too, that next time I would lessen the egg and maybe the baking powder too. The cookies rise really high and fluffy. I found my dress already, it’s on my wedding page. I am wearing a Justin Alexander wedding gown. BUT when I was starting to look for dresses, Maggie Sotero was one of the designers I was looking into. I liked the design of her dresses, so feminine. The bridal salon I went to here in Orange County didn’t carry her dresses. I am in love with my dress and I’m so excited to wear it. I’m going to wear it at least 3 times 🙂 The wedding, TTD session and maybe a welcome home reception.